My first blog entry for Kugels and Collards was a sweet kugel that my grandmother Ida Lomansky Kligman made. Now that we have our very own Collard Kugel recipe which is a savory kugel, I have a renewed interest in finding out more about savory kugels. Savory Kugels may be based on potatoes, matzah, cabbage, carrots, zucchini, spinach, cauliflower, mushrooms, onions or cheese. In Lithuania there is a dish that is called “Kugelis”. It is a baked potato pudding, and it is a traditional Lithuanian dish. The main ingredients are potatoes, onions and eggs. I have asked Christine Beresniova, Executive Director of the South Carolina Council on the Holocaust for more information about Kugelis. Her husband, Rokas Beresnoiva hails from Lithuania where Kugelis originated. Birute, Christine’s mother-in-law has given us her personal recipe for Kugelis. Christine has sent two recipes: One is the handwritten recipe (in Lithuanian) by her mother-in-law Birute Beresniova. It features kugelis both with chicken and one without meat. Christine explains, “I didn’t translate it because there is virtually no difference in the base preparation for any kugelis recipe. The second recipe is from the cookbook given to me and my husband by a family friend when we got married. It was originally printed in 1955 by Lithuanians living in the US, and it hasn’t changed since then. 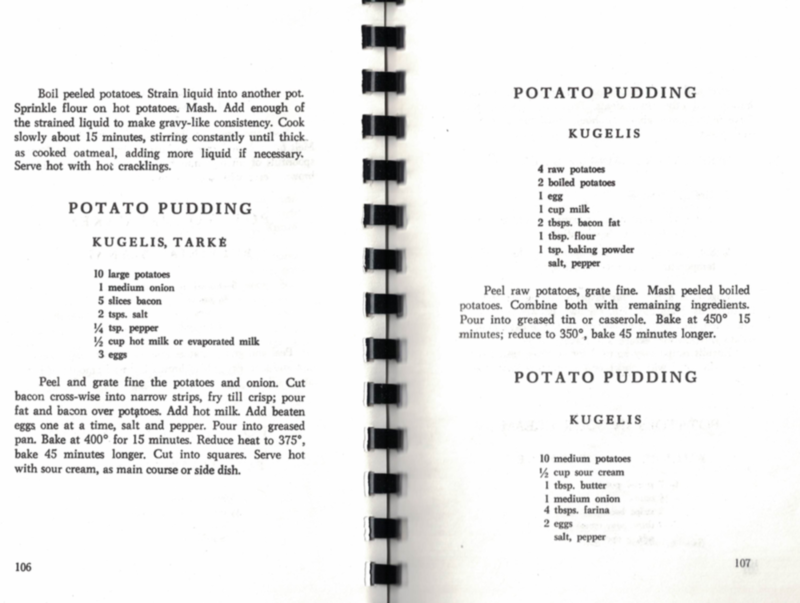 The base recipes for kugelis are all essentially same; they involve grated potatoes, eggs, flours of some kind, milk, and salt. For some ethnic Lithuanians, they mix in pork or bacon. For other Lithuanians and for Jewish Lithuanians, they cook it with chicken. This is how my husband grew up (with chicken drumsticks stuck in it). You find the chicken recipe more common in rural areas where both Jews and Lithuanians were in close proximity and were both impoverished and they couldn’t afford a lot. Jews used to make kugelis on Shabbat. That was usually the only time of week they ate meat. Just like borscht, there are different recipes for kugelis for each family with different add-ins. There is a sour cream butter sauce that some people make with bacon or onions. Others just serve it with sour cream. Some eat it with jam (lingonberry is common). My mother-in-law swears that Lithuanian potatoes cook better, something about their flavor and starch content. She likes the yellow gold or the red potatoes. She doesn’t use russets or baking potatoes. She also swears that a good kugel is in how you grate and prep the potatoes. She does everything by hand and soaks the potatoes. She used a food processor once at our insistence and she was sorely disappointed. It is a lot of work to grate 3 pounds of potatoes by hand, but it tastes better. My earliest memories of a kugel are that of egg noodles combined with eggs, milk, butter, cinnamon, sugar and raisins baked into a sweet dish that was, it seemed, always on our dinner table. This kugel must have been my paternal grandmother’s recipe that she taught to Ethel Glover, the African-American woman who cooked for three generations of the family. It’s a recipe that wasn’t written down, but through trial and error (and many other recipes in various cookbooks) I have managed to duplicate. I must add that it’s not my favorite kugel but, it’s the one from my childhood that takes me back to our family dinner table of fried chicken, seasonal fresh vegetables, and kugel. This may not sound quite as healthy as we eat today, but it was homecooked and always fresh. Kugel recipes today are very creative. Our Collard Kugel, courtesy of Joan Nathan, is savory. Adding pineapple and cheeses can make a kugel luscious and more custard-like. But, none take me back to my family dinner table like Ethel’s somewhat dry kugel with its crispy noodles that were baked to golden perfection. I can taste it and smell it even today. Cook noodles al dente. Mix eggs and milk together. Mix cinnamon and sugar together. Pour all ingredients over drained noodles and mix well. Add bit of extra butter sugar on top for browning. Pour into greased baking dish. Bake at 350 until brown on top. UPDATE: I made the kugel for this post (see photos above). This kugel is simple and really delicious and now will again be on my dinner table! Advertisement promoting Thanksgiving at Ben David’s Parlor Restaurant, 1910. Reprinted from The State, November 22, 1910. On November 22, 1910, The State ran an advertisement touting the Thanksgiving menu offered by Ben David, the proprietor of the Parlor Restaurant. The food included American staples like crème of celery soup, “prime ribs of western beef,” “mashed and whole boiled potatoes,” and of course, turkey, albeit with “chesnut dressing.” By then, the Parlor Restaurant’s reputation for providing excellent food and service at reasonable prices had helped Columbia become “the square meal town.” For 18 years, David served legislators, businessmen, students, and tourists a plethora of foodstuffs – particularly oysters and wild game – that were likely at odds with the kosher upbringing of his parents, if not himself. Advertisement for Parlor Restaurant, which featured “Fresh Norfolk Oysters” daily. Reprinted from The State, January 26, 1897. Description of the “Fenestral Art” displayed in and around the Parlor Restaurant’s storefront. Reprinted from The State, January 26, 1897. In 1900, David moved his restaurant to 1336 Main Street, where he remained open night and day for more than 10 years. Advertisements for the Parlor Restaurant frequently used Ben David’s likeness. Reprinted from the University of South Carolina’s 1902 Garnet and Black yearbook. The planned construction of the Arcade Mall at 1332 Main Street forced the Parlor Restaurant to relocated across the street, where it remained until 1913. Upon his death in 1920, “Uncle Ben” was eulogized in The State. Edward N. Carpenter, a friend from his youth, summed up his life thusly: “one of the best men [I] had ever known. In charitable causes he was generous, too much so it is said. His life was one of usefulness.” David, along with his siblings, is buried at the Hebrew Benevolent Society Cemetery in Columbia. Like many Southern Jewish families, our families gathered together each year with extended family to enjoy both religious and secular holidays. Of course, the dinner table was the epicenter these happy celebrations. Menus were well-established with family-designated cooks knowing exactly what their contribution to the menu was for any given meal. Thanksgiving was one of those celebrations. When our children were young, we would all gather—the Levinsons, Kligmans, and Dickmans—to enjoy the festivities. Selma and Max Dickman hosted for years, first at their home on Lake Murray and then when Max passed away, Selma would host Thanksgiving in her beautiful home in Spring Valley. There was an annual photo taken of the children – each year the photo added a couple of “newcomers” until we had a good 16 or so! The Thanksgiving meal was a wonderful combination of traditional Thanksgiving dishes, combined with several Jewish contributions (the omnipresent kugel and brisket for instance!) Everyone was assigned a dish and over the years that became their traditional annual contribution for Thanksgiving. My contribution is a cranberry relish made from fresh cranberries and citrus fruit. It has graced the family Thanksgiving table over the last 20 years. The cranberry relish is not only good with turkey, but also on sandwiches and served with cheese platters. I make a big batch to give away for the holidays, wrap it jelly jars, and with friends and neighbors. Rinse off cranberries and place in food processor with chopping blade. Chop cranberries into very small pieces and place in a large bowl. Quarter and seed oranges, lemons, and apples and place in food processor. Chop these fruits into very small pieces and add to the cranberries. Add the jar of raspberry preserves. Mix well. If the cranberry relish is a little too tangy add a little sugar to taste. Serve in a bowl, or can be canned in jars. Relish must be refrigerated. It will last for about 6 months in a tightly sealed jar. Good with turkey, ham, on sandwiches, or on brie cheese or cream cheese. My contribution is a recipe that I found in an old Southern Living cookbook that, with a few tweaks, is almost as good as the corn pie Ethel Glover used to make me when I was a child in Summerton, South Carolina. She has always been a cooking inspiration for me and many of my recipes today are from her kitchen. Melt butter in saucepan. Add flour. Stir well to make a roux. Add sugar and salt. Stir constantly 1 minute until smooth. Slowly add milk, stirring until thick. Add corn to the mixture. Crack and beat eggs in a separate bowl. Slowly add eggs to corn mixture. Pour into a greased 9 x 12 baking dish. Bake at 350 degrees for an hour. Beth Shalom Synagogue Celebrates Ten-Year Anniversary of Bubbie’s Brisket and Bakery Extravaganza! Randy’s original goal for a premiere Jewish Food Festival has come true, but he says that his favorite aspect of the festival is “the spirit de corps.” He really enjoys working together with new and old Beth Shalom members, who volunteer both in and out of the kitchen to get the festival ready! It brings the synagogue community together for a common goal. According to Randy, the festival is a different kind of spirituality. It’s one of connections and joy that he personally cherishes as a Jewish value. The Stark family have long been an integral part of Columbia’s Jewish community. Randy Stark is the youngest son of Suzi and Scrappy Stark. His older brother, Andy, lives in Memphis. He was born in Norfolk, Virginia, his parent’s hometown. The family moved to Columbia in 1971 when Randy was 1 ½ years old, and he considers himself a native Columbian. His father retired after a career as an admissions officer at USC, and his mother served on the at Benedict College for 20 years. After graduating from the University of Alabama, Randy interned at Disney in Orlando, where he met his wife, Cindy. They both attended the University of Florida where he received his MBA and Cindy her nursing credentials. Since returning, they have always lived in close proximity to the Jewish Community Center and the synagogue, where their sons have gone to Sunday school and their oldest two have celebrated their Bar Mitzvahs. As a child, Randy grew up at the old Jewish Community Center on Trenholm Road and remembers his days of playing interfaith basketball. Now, Randy serves as a basketball coach for the interfaith league and also on the Beth Shalom Synagogue Board. Randy and Cindy are both “doers,” and he credits the strong, positive feelings of growing up in a close Jewish community for his strong Jewish activism today. He is proud that his parents are receiving this year’s Beth Shalom synagogue’s highest award, called “The Magen David Award,” for their service to the synagogue and community. Randy shared a fond memory from the first 5 years of Bubbie’s when he gathered a team of his buddies to prep the festival’s chicken soup. Picture a gaggle of guys, listening to music, drinking a few cold ones, and cutting up carrots, celery, and onions while just plain cutting up. He still remembers the laughter of those long evenings. The recipe is one contributed by his wife, Cindy Stankiewicz Stark. She was given a Passover cookbook by her mother-in-law, Suzi Stark, when she and Randy married over 22 years ago. Cindy has tweaked it over the years to make it the award-winning and best-selling chicken soup for the festival. Cooking the chicken soup for the festival entails three 20-gallon pots of chicken broth, 12 chickens, 9 pounds of carrots, celery, and 12 onions. The cooking crew does this twice! Randy admits that his favorite thing at the Food Festival is the big corned beef sandwich. “It’s kosher meat brought in from Griller’s Pride in Atlanta and it’s just delicious. I think it’s hands down the best corned beef sandwich in the South! Better than Carnegie or Katz deli in New York.” Ten years ago, Randy’s idea of the Brisket Bakeoff was a winner, and Bubbie’s Brisket and Bakery Extravaganza carries on the tradition today. As for Randy and Cindy, they entered their Matzo Ball (chicken soup) recipe in that first year’s cookoff, and it won! They proudly display their bronze engraved award for the chicken soup in their kitchen. Mix creamed butter, sugar, sour cream, and vanilla. Add yeast and flour and salt. Divide into 6 parts and refrigerate overnight. Roll out each ball into a 9-inch circle. Spread cinnamon, nut, sugar, and/or preserves. (I add some unsalted butter.) Cut into pie-shaped wedges and roll into rugelach shapes. Place on buttered cookie sheets. Bake approximately 15 minutes at 350 degrees. Wash chicken, removing fat and skin. Place in large (at least 6-quart) pot. Add water, one quart per pound of chicken. Bring to a boil, skimming as needed. Simmer for 30 minutes, then add vegetables and seasonings. Simmer covered for 1 ½ - 2 hours until chicken is tender. Remove chicken (which can be used for other meals). If desired, strain soup. Add matzo balls. Mix fat or oil and eggs together. Mix together matzo meal and salt and all fat or oil and eggs. When well blended, add soup stock or water. Cover bowl and refrigerate for 20 minutes. Bring to boil 2-3 quarts of water. Form balls about the size of walnuts from the matzo meal mixture and drop them into the boiling water. Cover and simmer for 30-40 minutes. Remove matzo balls and add to warm chicken soup. In this post, Suzi Fields recounts how one recipe, her mother’s Passover Matzo Ball Soup, has connected multiple generations of her family. Although her mother, Sylvia Fisher, did not keep kosher, her grandmother did, and Sylvia was raised to prepare foods according to Jewish tradition, including on holidays, festivals and the Sabbath. After spending their careers in Detroit, Michigan, Sylvia and her husband, George, retired to Spartanburg in 1982 to be near Suzi, her son-in-law, Dr. Sander Fields, and grandchildren. Boil water, add chicken, add vegetables. Cook about 1 hour. To serve clear, remove chicken and vegetables, or serve with carrots. Mix fat and eggs together. Combine Matzo meal and salt; add to egg mixture. When well blended, add soup stock or water. Cover mixing bowl and place in refrigeration for at least 20 minutes. When chilled, form into balls. Using a 2 or 3 quart pot, bring salted water to a brisk boil. Reduce flame and drop balls into slightly bubbling water. Cover pot and cook 30 to 40 minutes. Remove from pot and put balls into chicken soup pot. I’ve never had a Christmas tree. This is something that my non-Jewish friends often find very odd. Quite possibly something even stranger is when I tell my Jewish friends about our Hanukkah bush, stockings, and when Santa would occasionally make a stop at our dark, un-festive house – much to my confusion growing up. So no, I never had a Christmas tree, but my father’s family would get together and decorate a bush with silver and blue ornaments (side note – where did we even get a bush?). My grandmother, Faye Levinson, knitted us blue and white Hanukkah stockings, which I still hang up. When I was little, I was sad our dogs didn’t have stockings, so I drew Stars of David on my tiny running socks and hung one for Moxie and one for Sunshine next to ours. My parents would fill them with small gifts, which we could open on the first night of Hanukkah along with our “big” present, (our tradition was to choose one “big” gift.) Through the years, I was the proud recipient of a portable DVD player (a road trip necessity in the early 2000s); a video camera (that I NEVER thought my parents were going to get me and freaked out over – I never used it); a keyboard (that I never learned to play correctly, and “mysteriously” disappeared one day); and an aquarium which I shared with my brother (my aunt and uncle gave it to us – my parents were not pleased). Although I never had a tree, I was always invited to a friend’s house for Christmas tree festivities. When I was very young, we would visit our neighbor’s house for latkes (although the neighbor wasn’t Jewish, she was raised in a Jewish neighborhood in NJ and made great latkes) and Christmas tree decorating. As I grew up, I was invited on trips to a local tree farm, Harmon Farms, for cider and tree cutting. In return, we always invited our friends over for a night of Hanukkah. My mom, Rachel Barnett, would cook latkes and make brisket, we’d light the candles, and play dreidel. Our friends begged to come over for Hanukkah each year. I suppose it was the only time they were ever graced with the deliciousness of fried potato pancakes. I don’t mean to speak ill of any of my grandmothers or restaurants or people who have made me latkes in my life, but my mom still makes the best. I know she hates it – spending hours grating potatoes and making the entire house smell like the back of a McDonalds, but I haven’t found any that are better (recipe below). I have many great memories celebrating Hanukkah with my family growing up, but there is always one tradition that stands out from the others. I grew up in Columbia, South Carolina and attended a public school where we were usually only one of very few Jewish families. Even though Satchel Ford Elementary was decked out in Christmas décor, each year they invited my family to decorate a Hanukkah window display in the front lobby. We would spend a Saturday at school taking much pride in our Hanukkah themed window. My mom would then spend a day at school and read a Hanukkah book and hand out dreidels and gelt (chocolate gold foiled coins) to everyone in my class – which definitely contributed to my popularity (because who doesn’t like chocolate and gambling). It’s a little bittersweet reflecting on my Hanukkah memories because sadly, we don’t do many of them anymore. As the baby of the family at 24 years old, our family has grown up and can’t find the eight nights to get together anymore. One thing that stays the same each year is that I still have never had a Christmas tree. I think this year, my non-Jewish roommate will be providing the tree, and I guess it’s my turn to learn how to make latkes. Emily Levinson (on right) with friends - Aly (on left), Bella and Abby (the furry ones) - celebrate a "golden" Chanukah! Heat oil in large frying pan. Once hot, place tablespoons of potato mixture into pan (careful not to splatter). Should be the size of medium size pancakes. Serve warm with sour cream and applesauce. In a Dutch oven or a stew pot; brown the cut up onions and add the cut up meat and cover with water. Cook the meat slowly until it softens and the water is absorbed. Par boil the carrots, the sweet potatoes, drain and add to the meat. Add the prunes, brown sugar and the can of cut up pineapple. Put this mixture in a buttered Pyrex dish. The traditional way is to mash the vegetables or the more recent way is to leave it in large pieces tossed together and cooked. Bake for 30-40 minutes at 350. It’s hard to believe that I now am the designated preparer of Chopped Liver in my family. Then again…no one else really wants to make it. It is a difficult and time consuming recipe. Cooking the liver and hard boiled eggs will certainly give the house a distinct aroma, so I always make sure and prepare it at least 24 hours before serving it. Chopped Liver is akin to liver pate that is usually served as an appetizer or as a side dish…hence the popular saying, “What am I…chopped liver.” It isn’t the centerpiece in a meal, even though it is a heavy meat dish high in protein and cholesterol. Chopped Liver is a dish of Eastern European / Ashkenazi origin that was commonly served in delicatessens. The first time I tasted chopped liver was in a sandwich with my parents in a New York delicatessen called the Carnegie Deli. It was huge. My father, Melton Kligman, happened to love liver. As a child, we would go out to eat at Morrison’s Cafeteria on Thursday nights just so he could order Liver and Onions. On Rosh Hashanah my mother, Helene Firetag Kligman, would make chopped liver and Dad would always make sure that there would be leftovers, so he could make a challah and chopped liver sandwich. Boil eggs until hard boiled. Peel shells and set aside to cool. Wash off liver and set aside. Chop up frozen chicken fat (schmaltz). In a large deep skillet, brown chicken fat (schmaltz) until very crispy, put on a paper towel to drain. The fried chicken fat (schmaltz) is now called Gribenes. Brown the chopped onions using the remaining fat in the skillet. Add the liver and ¼ cup of sugar and stir until the liver begins to turn brown. Drain off the liquid from time to time and cook on medium heat until all liver is brown. Put the liver and eggs in a large bowl and hand chop until chunky or smooth, depending on taste. Add mayonnaise and salt and pepper to taste. Serve on a platter with crackers, raw celery and carrots. After it is made, it will last in the fridge for 3 or 4 days. I like to make it a couple of days before as the flavor seems better. Take the head of the cabbage and cut out the stem and put in a pot and cover the cabbage with water. Bring the water to boil turn off and let cabbage sit for 10-15 minutes. Drain the cabbage and peel off the cabbage leaves. They should be soft, wilted and easy to manage. Let sit on a paper towel until meat mixture is ready. Make the instant rice. And put in a bowl with the two eggs and the ground beef. Add salt and pepper. Mix with a wooden spoon or your hands. Make golf ball size meatballs with all of the mixture. Put the Dutch oven on the stove and pour a little bit of chili sauce to cover the bottom of the pot. Take the cabbage leaf and place the meatball at the thickest part of the cabbage leaf and roll the cabbage leaf around the meatball, taking the thinnest part of the leaf and tucking it under the whole ball. It should be a nice wrapped meatball. Take two of the smaller leafs and make it into a makeshift roll, which will stay together while cooking. When you finish a meatball wrapped in cabbage, place it fold down in the bottom of the pot. Stack each stuffed cabbage until you finish the meatballs and cabbage. It should work out nicely. Pour the rest of the chili sauce over all the stacked stuffed cabbages. Pour the Grape Jelly over the Stuffed Cabbage. Sprinkle the handful of golden raisins on top. Cover and cook on low for about 2 hours. The sauce will cover all the stuffed cabbage. It’s best to make this at least 48 to 24 hours before serving and refrigerate. You can also freeze and reheat. Use a large spoon and put stuffed cabbage in a shallow bowl or deep platter. Serve the stuffed cabbage with plenty of sauce and the raisins on top. Kasha Varnishkes is a traditional Ashkenazi Eastern European dish. The word Varnishkes is a Yiddish word for a Russian small stuffed dumpling called Varenichki. Kasha is a buckwheat grain that is originally from Asia. It is a creative dish that has a distinct flavor but can be also thought of as a Jewish comfort food. I can’t remember the first time I tasted Kasha Varnishkes, but it must have been as an adult. The Kasha grain has a strong, toasted flavor and that seems to be the secret when preparing the dish. I remember only eating this dish at Rosh Hashanah, but it is also served at the Sabbath meal. It is an excellent grain and pasta dish to accompany a brisket or chicken that has lots of sauce or gravy. I started adding it to my Rosh Hashanah meal to add a traditional recipe to the meal. I took several recipes and combined what I liked to make the one I use. I think it would be fun to ask people who have no idea what this dish is…what they think Kasha Varnishkes is! Cook the box of bowtie noodles and drain. Fry the chopped onions in the chicken fat or butter until they are caramelized. Put the Kasha on an aluminum foil-covered cookie sheet sprayed with Pam and toast the Kasha grain, being careful not to let it burn. Bring the 4 cups of chicken broth to boil and put in the Kasha grain. Cook on medium until all the liquid is absorbed about 25-30 minutes. The Kasha should absorb all the water. Mix in the caramelized onions. Mix the cooked Kasha, onions and boiled noodles together in a large baking dish and bake for about 20 minutes. It will be dry. Serve with brisket or chicken - The Kasha Varnishkes will be a good base for the gravy. Challah, braided yeast bread, is traditional to have for weekly Shabbat and High Holiday meals. Many years ago I took on the responsibility for being the bread maker for my family. I have to admit, I changed recipes several times since my original recipe called for 9 eggs. Challah is considered an egg bread so I thought that was normal until I became conscious of increased cholesterol from that many eggs in one recipe. Several recipes called for more yeast and less eggs and I finally found the perfect combination for my recipe. I do think one of the secrets is adding an extra tablespoon of honey to give it a sweet taste and it also makes the texture slightly more moist. Growing up in Columbia, my family would come together every Friday night for a Shabbat dinner. At that time we probably had challah made from a bakery because I don’t remember my mother baking bread. I learned how to make brisket and meatballs with cabbage and other Jewish foods from my mom, but not bread. My mother’s sister, Phyllis Firetag Hyman, shared her recipe with me when I was in high school and I started baking challahs for the High Holidays. From then on, no more bakery challahs for our family. I would always make sure we had challah for Shabbats and every holiday. I even made extra round challahs with raisins for Rosh Hashanah to share with our family friends, the Levinsons, Polinskys and Levines and a few others. I even remember one time going over to Gloria Rittenberg’s home to teach her how to make Challah. When my children were younger I would get them involved in the mixing, kneading and braiding. When the kids moved away, I always made it a point to send them each a fresh challah for the holidays if they could not make it home. I am happy to say that my daughter, Morgan, still follows my recipe and bakes challah today. Every time she does, I get a beautiful photo of her fresh baked bread. She loves to share with her friends and coworkers. Sharing recipes with friends is always fun, but when you share a traditional Jewish recipe with others of different faiths it helps to teach about our culture. Sally Patterson, a Presbyterian and a friend for over 40 years, now makes challah for her family. Beth Shalom Synagogue has a fundraiser every fall, called Bubbie’s Food Extravaganza. The very first year in 2009, it was Bubbie’s Bake-Off, a competition for the best recipes of brisket, kugels, chicken soup and challah. I entered my challah recipe and won first place. For the past seven years I have baked hundreds of challahs in the synagogue kitchen for the annual Bubbie’s Food Extravaganza. This has also given me the opportunity to teach dozens of women in our synagogue this beautiful and traditional food art of kneading dough and braiding bread. This year the event is scheduled for Sunday, November 12th. Come by and purchase several loaves of bread, they freeze perfectly for months. Making Heidi's Challah at the Beth Shalom Synagogue. Dissolve yeast in water and add sugar and salt. Let stand until bubbly. Put 7 cups flour in large bowl. Combine oil and two beaten eggs, add 2 tablespoons honey to the mixture. Add to flour. Slowly mix in yeast mixture, making sure all flour is mixed in. (This can be done by hand with a wooden spoon or in an extra-large mixer with dough hook attachment.) Add 5 to 6 more cups flour slowly and mix well until slight gooey but easy to manage. (Hand kneading is best.) Transfer ball of dough into a lightly greased bowl and cover with plastic wrap. Set in a warm place to rise for 2 hours. Knead and divide into seven balls to make seven challahs. Take each ball, divide it into three or four strands and braid, making sure you pinch and tuck the ends under the loaf. While kneading and braiding, keep flour on counter surface to keep dough from sticking. Place braided challahs on pan that is lightly sprayed with nonstick cooking spray. Let rise for another 30 minutes to an hour. Brush top with egg wash (one beaten egg should cover all seven challahs). Sprinkle with poppy seeds. Bake at 325 degrees for 30 minutes until golden brown. When I was a kid growing up in a small Southern town, the staple lunch was fried chicken, rice and collards. It wasn’t until I was an adult that I could really appreciate those collards. Many Southern vegetable recipes call for pork for seasoning, but in my mother’s semi-Kosher Jewish kitchen, that wasn’t happening. So, to flavor the collards, a pinch of sugar, salt, pepper and butter were used. I have “skinnied” my recipe now to use olive oil and chicken or vegetable broth to flavor. Italian seasoning and diced tomatoes adds a bit more “gourmet” taste. Sauté chopped onion in olive oil until soft. Add fresh collards, diced tomatoes, chicken (or vegetable broth), Italian seasoning, pinch of sugar, S & P. Give a good stir. Cover and cook on medium until vegetables are soft. Adjust seasonings to taste.